Like many ancient cultures, the Egyptians put quite a bit of emphasis on dreams. They felt that the messages delivered in their dreams could cure an illness and help them make important decisions, to the point of deciding where to build a new temple or when to wage a war. Because these dreams were so important, the Egyptians often sought out dream interpretation to find the true, underlying meaning of the dream. In ancient Egypt, it was believed that dreams were answers delivered by the gods to help people with their daily questions and problems. In fact, they often went to a dream temple to help summon such dreams. This was known as dream incubation. There were dream temples built specifically for this reason. The temples were open to everyone who believed in the god the temple was dedicated to, as long as they were considered pure. To achieve this, the person often went through a ritual of cleansing that included fasting and abstinence for several days prior to entering the temple to assure their purity. The name of the god the person hoped to contact at the temple was written on a piece of linen and that linen cloth was burned in a lamp while at the temple. To help call the god, the dreamer would often recite a special prayer to him or her. Once they visited the ancient Egypt dream temple, the person would often go to a priest or dream interpreter for dream analysis. Because they put so much stock into dreams, it was important for Egyptians to be able to understand the significance and meaning of their dreams. Like many others, some Egyptians kept a Dream Book – a book that chronicled their dreams and the interpretation of them. One such Dream Book, written on papyrus, dates all the way back to approximately 1275 BC, during the reign of Ramesses II. It is believed that the ancient Egypt Dream Book kept in The British Museum in London had many owners as it was passed down for more than a century. All in all, the Dream Book included 108 different dreams, which included such activities as weaving, stirring, seeing, eating, and drinking. The dreams were categorised into good dreams and bad dreams, with the bad dreams being written in red, a colour of bad omens. In this book, there are hieratic signs that state such interpretations, as that it is good when a man dreams he sees himself looking out a window. Even a man seeing himself dead was seen as a good sign, meaning that he would live a long life. However, if a man dreamed he saw his own face in a mirror it was a bad omen. Also, dreaming of putting your own face to the ground was seen as a bad omen. It was believed that that particular dream meant that the dead wanted something. Like today, the ancient Egyptians had some dreams that were more prevalent than others were. People often dreamed of breaking stones, which the Egyptians interpreted as having one’s teeth fall out. Dreaming of your teeth falling out is still a common dream today. Many often dreamed of drowning in the Nile or climbing to the top of the mast of a ship. However, some other common dreams seem to defy explanation. Dreaming that your face turned into a leopard was a common dream in ancient Egypt. 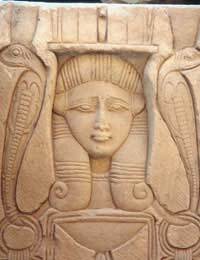 The Egyptians also believed that their dreams could serve as a window to see the activities of the dead. However, they often feared these types of dreams – afraid that this could bring about unwanted, evil spirits. In ancient Egypt, dreams were held in high regards. Ancient Egyptians used their dreams as a way to receive messages from the gods and they used these messages from their dreams to guide their lives. To help them further understand the dream analysis, they wrote them down or often consulted a higher authority. A respected individual, such as a priest, could be consulted to help them fully understand the dream interpretation.